Considering how hard it was for women to be accepted as artists (in the US) in the 1800s, and considering that it was frowned upon for them to attend art schools, it still amazes me how many women became sculptors in the early to mid-19th century. Yet, here we have another example of a woman who turned from studies in painting to become a sculptor. Sculpture was considered, at the time, a man’s “domain” because it involved physical activity, and might, (gasp) cause the need to climb a ladder or scaffold to work on a monumental piece. That could mean women might have to wear pants (gasp) like male artists. We always think of Europe as more liberal when it came to women artists, but never forget that the painter Rosa Bonheur had to obtain a police permit to wear pants in public in order to study barnyard animals! Stebbins, like Bonheur, is a truly unique individual in the history of art, and in the study of women artists. While I continue to say that women have always been important participants in the history of art, that doesn’t mean that they’ve been adequately represented in textbooks that students see. I am, humbly, here trying to correct that. Sculpture in the 1800s in both Europe and America was dominated by Neoclassicism. It was also a field in art that was considered too “unladylike” a discipline for women artists because of the physical nature of the work, especially in monumental pieces. There were several pioneer woman sculptors, Stebbins being one of them. Stebbins was encouraged to pursue art by her family while growing up in New York City. She studied at various art schools in New York, and was elected to the National Academy of Design in 1843, a rare occurrence in 1800s America. In 1857 she wet to Rome in order to study the abundant examples of ancient Greek and Roman art. Although she had initially trained to be a painter, once in Rome she decided to pursue sculpture as her medium. She joined a circle of expatriate American women artists of sculptor Harriet Hosmer (1830–1908). Hosmer had established a lively community of American woman sculptors that include Anne Whitney (1821–1915) and Edmonia Lewis (1844–1907). There, Stebbins found the support of teachers, fellow women students, and the inspiration of being surrounded by classical art (which informed her mature style). She also met her partner, Charlotte Cushman (1816–1876), there, an internationally known actress, who was Abraham Lincoln’s favorite for interpreting Shakespeare. Stebbins’ work reflected the prevailing taste for Neoclassicism in sculpture that had endured since the Renaissance in one form or another, and prevailed—especially in the US—until the mid-1900s. While she produced many lofty allegorical works in the classical style, she also applied that style to more humble subjects such as the Machinist and his Apprentice. Works such as the Machinist reveal Stebbins’ no-nonsense American point of view combined with the Neoclassical style. This figure reflects the growing influence of the Industrial Revolution on American art. 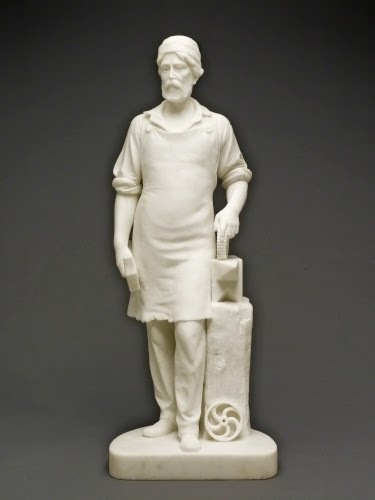 While depicting a humble working person, Stebbins has imbued the figure with the timeless grace and dignity of classical art, visible particularly in the contraposto (hip-shot) pose and attached support that are seen in Roman and Greek marble sculpture.